The Modern Classic might not impress non-drummers in terms of the way it looks, but it sounds simply sublime. There's something very special about solid shell drums, both sonically and due to their labour-intensive production. Most of all though, there's a cachet about owning one that's well borne out by its sonic performance. Completely fantastic tone. Craviotto association adds real value. Not many were made so you'll have to hunt one down. The Modern Classic series has been one of Premier's strongest suits. Johnny Craviotto doesn't put his name to dodgy drums. There's no arguing with the fact that the Modern Classic snare drum series has been one of Premier's strongest suits over the years. The company's range of maple, birch and maple/birch hybrid drums has been enormously well received by both press and public, raising the brand's profile enormously. Premier delivered the icing on the MC cake when it announced the arrival of some very special snare drums, produced in conjunction with a mystery master. And here it is - a Premier Modern Classic solid shell maple snare with shell by none other than Johnny Craviotto. It's expensive and it's rare. How rare? Well, the one you see here is one of just 50 that the company will be making. 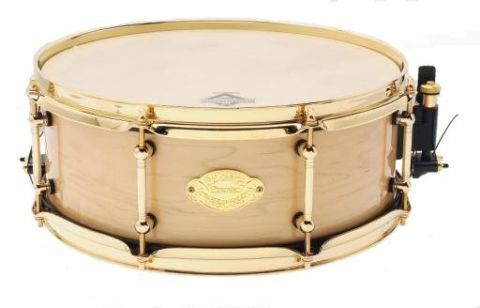 largely gold-plated - there's a Nickel Drumworks snare throw-off and 16-strand Puresound snare wires. But the drum itself? It's something of a shrinking violet to be honest. Maple, unless it features ﬂamed or birdseye grain patterns, is a bit of a plain Jane lookswise. Since there's nothing to shout about in terms of colour or grain here, it's a very unprepossessing instrument in terms of basic aesthetics. Good job then, that everything else is way more impressive. The above-mentioned shell furniture is top stuff and the drum wears heads manufactured for Premier by Remo. Rather than the 'default' coated Ambassador snare head, Premier has chosen to specify a Renaissance Ambassador batter and hazy Diplomat snare-side head. So what's the tonal result of these two and that hefty shell? In short, remarkable sweetness and a smooth edge that's immediately engaging. It's hard to describe in words but there's a completeness and 'produced' air about the sound of this drum that makes it really something special. And it's tolerant of the most dismissive attempts at tuning too. At mid-tension it delivers a superbly full, velvety backbeat with sizzling (but not over-pronounced) ghostnotes. The Renaissance head adds a slightly dark flavour that makes the snare well-suited to moody jazz and cool, dirty funk. And although we were hesitant to simply pile on the tension, at higher pitch it retained plenty of character, dishing out a succinct pop that would make recording hip-hop on this thing pure joy. Johnny Craviotto doesn't put his name to dodgy drums, and Premier's Modern Classic series is too important to muck up by adding over-priced, inferior products. So it's no surprise that this snare is completely beguiling, in an aural sense at least.